In California, Aid Withers For People With Developmental Disabilities : Shots - Health News Budget cuts and rising costs are imperiling California's programs for people with developmental disabilities. The state had led the nation in providing innovative community based services. Michael Palone, 26, who has mild autism, originally diagnosed as Asperger's syndrome, is paid to assemble packages through a program run by The Arc in Union City, Calif. The program may close soon due to budget problems. The Arc is a national nonprofit with chapters across the country that offer programs and services for people with developmental disabilities. "It means a lot to me," Palone says. "It gets me out of the house, and it helps me interact with people." Before joining the work activity center, Palone mostly stayed at home, in his room, playing computer games all day. He couldn't complete simple tasks like doing his laundry without his mother's help. But since he joined The Arc two years ago, his mother, Rosemary, said that the change in his behavior has been remarkable. "When I first found out how good the program was for him, it made me cry," she said. Now Michael voluntarily joins her on trips to the grocery store, sits with the family in the living room and even washes his own clothes without needing a reminder. Plus, his work is paid. He earns about $300 per month, which he uses to buy magic cards or to treat his niece to lunch. "We talk more now than we ever did throughout his entire childhood," Rosemary Palone says. But she fears that her son will return to his reclusive ways. Due to a lack of funding and the increasing cost of living in the San Francisco Bay area, the Arc can no longer shoulder the costs of running the program and plans to close the work center in a few months. Rosemary Palone worries that Michael and other clients like him will have nowhere else to go. "If he doesn't keep going to this program, all of the progress that he's made over the past two years will just be gone in two weeks," she said. The work activity center is funded through a combination of state and federal money. But Ron Luter, president and CEO of The Arc of Alameda County, says it's not enough to cover costs, and it's hurting the rest of the agency. "The work activity center is really pulling this facility down," Luter says. During its heyday, the workshop bustled with activity as the main co-packager for Ghirardelli Chocolate, but it lost the contract when the company moved its packaging facility to Modesto several years ago. Now packaging machines sit in the room collecting dust. Although The Arc of Alameda County's annual budget is $5 million, Luter said that the four centers he heads in the East Bay have lost about $1 million over the past three years. Luter has been running clothing drives and dipping into savings from the sale of two former Arc of Alameda properties, but the pool of extra money will soon run dry, he says. The Arc of Alameda's plight echoes that of similar organizations across the state. California was once known as a pioneer for spearheading alternatives to confining people with developmental disabilities in state-run institutions that were notoriously overcrowded and separated patients from their loved ones. In 1965, the California Legislature passed AB 691, a pilot program that created the first regional centers. These agencies were designed to coordinate community-based services so people with developmental disabilities could live independently or with their families. Today there are 21 nonprofit regional centers across California that handle case management and program development, among many other services. But in the wake of The Great Recession, more than $1 billion in state budget cuts threaten the system. In a grimly-titled report, On the Brink of Collapse, the Association of Regional Center Agencies (ARCA) noted that state has the lowest funding in the country for individuals with a developmental disability who qualify for services. In addition, payments to service providers have been frozen since 2003, meaning that agencies are running on a rate model that was created over a decade ago. The situation is especially pronounced in the expensive Bay Area because provider rates are the same statewide. Eileen Richey, executive director of ARCA, says the lack of funding puts Californians with developmental disabilities at risk. "All of these challenges now mean that more people have to wait to get into a program," Richey said. "And everyone throughout the system ends up having to do more with less ... continually worsening the quality of life for people with developmental disabilities and their families." Richey added that it's nearly impossible to find qualified long-term staff to work at the rate the organizations offer. Constant staff turnover makes providing quality care even more challenging. "The turnover rate is so high," Luter of the Arc of Alameda says of his dwindling staff. "We're competing with people for jobs at In-N-Out Burger. Half of the people who work for me have two jobs just to survive." At his work activity center, Luter said that the ratio of clients to staff should be 10 to 1, but it's currently double that because he can't afford to pay any more workers. The work activity center at The Arc of Alameda in Union City is just one of the programs in the Bay Area that will be shutting down over the next few months because of funding issues. Luter also plans to close a child care program in Hayward, where he said deficits have run from $40,000 to $100,000 per year since 2010. The center serves children ages 2 to 5 with mild to moderate disabilities or developmental delays. A combination of factors forced Barbara Maizie, executive director of Contra Costa ARC, to decide to close the Lynn Center, a program serving children 15 months to 5 years with developmental delays and autism, on Dec. 1. Maizie says the low funding levels had already strained her agency. Then the Lynn Center faced relocation when the elementary school housing its program was taken back by the district. Maizie realized that they couldn't afford the relocation costs. "There have been many challenges to running this program in the past, and we were always able to rise to the occasion," she says. "But the funding has just become so impossible that we can't any longer." The Lynn Center closure is the fourth her agency has seen over the last year, says Ronke Sodipo, director of community services at the Regional Center of the East Bay. The nonprofit agency works with California's Department of Developmental Services to coordinate programs in Alameda and Contra Costa counties for people with developmental disabilities. Out of the 102 clients in the closed programs, she says, up to half have not yet been placed in another center. Recent changes in labor laws have exacerbated funding issues for the scores of organizations that provide services throughout the East Bay, Sodipo says. A new statewide law that requires paid sick leave; the Affordable Care Act requirement that employers with more than 50 full time employees provide health insurance; an increase in overtime pay; and the higher minimum wage in Oakland and Emeryville have all created additional costs for the organizations. "I don't know that our service providers would be as severely impacted if their costs were taken into consideration and they were given rate adjustments to absorb some of it," Sodipo said. Seeking to address the losses from years of underfunding, The Lanterman Coalition — an alliance of 20 organizations and businesses including agencies that provide services for those with disabilities and advocacy groups — took action earlier this year and lobbied state legislators for a 10 percent across-the-board funding increase for service providers. The proposal was ultimately removed from the state budget that was signed in June. But Gov. Jerry Brown then called a special session of the legislature this fall to address this funding question and other fiscal issues. A bill proposed by Sen. Ed Hernandez, D-West Covina, would impose a $2 per pack tax on cigarettes and provide an annual increase of $230 million for regional centers and service providers. "California's developmental disability system has been struggling for many years – it's time that system sees some benefit from California's economic recovery," Hernandez said in an email. "I remain hopeful that we are able to use this special session to provide long overdue relief to the community." Legislators across party lines seem to be in general agreement that provider rates need to increase, but they differ on how much of an increase is needed — and strategies for funding it. One issue is that agencies serving people with developmental disabilities have not been required to submit a statement of their annual costs to the regional centers in over 10 years. "That said, it begs the question of what then is the appropriate rate?" says Mark Newton, a policy analyst from the nonpartisan Legislative Analyst's Office. "That's a tough issue in a way, because of a lack of collected and reported cost data that would help address a formulation of an appropriate rate structure." Although the legislative special session is still open, legislators have not met since September 11, and there is no sign they will be reconvening before the end of the year. Advocates for more funding are planning a march to the capitol in Sacramento on Dec. 10. Luter says he will carry a coffin symbolizing what he calls the "death" of the Lanterman Act. "We're not treating these folks as if they're part of the fabric of the community," he says. Valerie deChadenedes, 30, of San Francisco, was diagnosed with Rett syndrome when she was 10. It's a rare neurodevelopmental disorder that inhibits brain growth and motor skills. 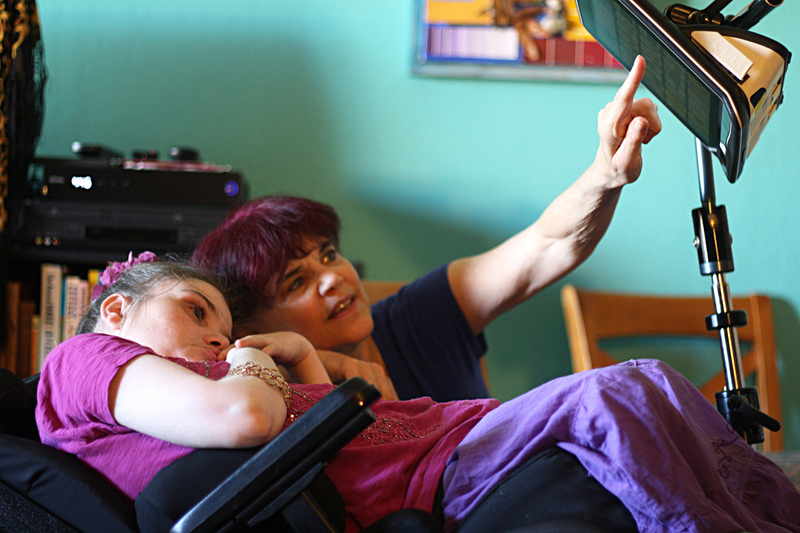 Valerie deChadenedes, 30, who has Rett syndrome, is now cared for by her mother, Audrey. DeChadenedes is unable to walk, talk or feed herself and needs assistance for many aspects of her life. But her mother, Audrey, says Valerie does enjoy being social with people her own age. She can put words together into sentences through an eye-tracking communication device mounted on her wheelchair. After she completed school eight years ago, she spent four years on a wait list before being placed into a program that could serve someone with her needs. She took art classes there and learned to be more self-sufficient. But five months ago, she was forced to leave the program when it turned out not to be licensed to provide care for medically fragile clients. Her case manager at the Golden Gate Regional Center said that there is no other day program in San Francisco that will be able to address her needs. Valerie now spends her days doing activities organized by her mother. "If it weren't for me, what would happen to Valerie?" Audrey deChadenedes wonders. After she was released from the program, Audrey said that Valerie would say, "I feel lonely," through her communication device. Frustrated by what she considers inertia in the legislature, Audrey deChadenedes started writing weekly letters to Brown and is keeping a blog called Valerie's Week in Review, where she details Valerie's health and the actions she's taking to find Valerie a new program and an apartment. In her last blog post on Nov. 3, Audrey closed this way: "As great direct-service people quit to make a living wage, as programs close, as things fall apart all around us, I am terrified for my daughter's future." Melissa Hellmann is a San Francisco Bay area-based reporter who has written for Time, The Christian Science Monitor and other publications. This story first appeared on KQED's State of Health blog.